Phokus Research Group, a part of the Safariland group, has created an incredible Trauma Kit targeted specifically for law enforcement and first responder use. 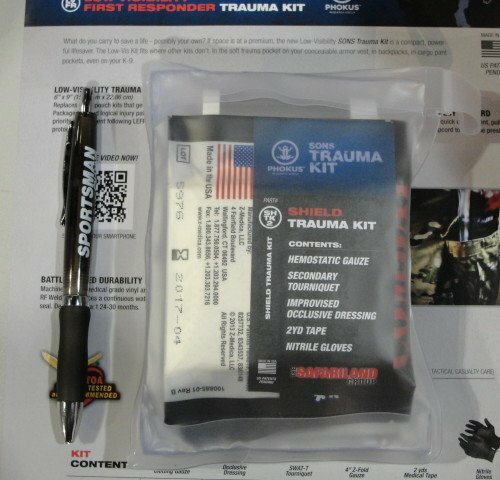 Named the Sons Trauma Kit, there are several versions targeted for specific uses. 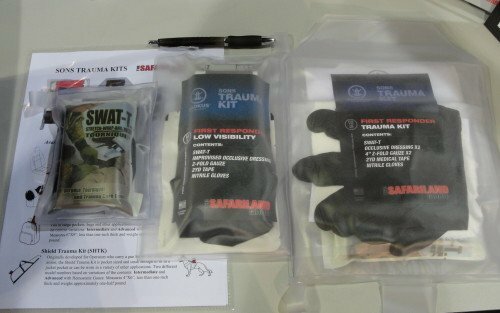 The kits contain the most important medical tools to life saving trauma care in the field, and are directly related to the concepts of Tactical Combat Casualty Care (TCCC). Phokus Research Group is a component of Safariland. The Sons Trauma Kits are great trauma kits, but each officer should investigate the options and specific needs before making a decision or purchasing trauma care supplies. Price – $265! (This is not how much a good kit should cost). Total Price – Approximately $70 (we individually purchased items, it’s cheaper). Though most EMS services are fairly quick to respond, arterial bleeding can kill in less than 5 minutes. Get a tourniquet! Get a kit! As mentioned in the previous article, the concepts of TCCC should be mandatory training for all law enforcement officers. These skills will likely be the difference between an officer dying from blood loss, or surviving to recall the events. This will be true whether the injured officer self-applies the life saving tools and procedures, or a buddy officer provides the care for a fallen brother or sister. In addition, when the scene has been secured, officers can begin life saving procedures while waiting on Fire and EMS personnel to respond. Several saves have been documented by officers properly trained and equipped who were the first upon a major crash scene, or the aftermath of a shooting or stabbing. (2) Improvised Occlusive Dressing – the pressure sealed vinyl bag containing the kit separates into two separate pieces for bandaging. As you can see, the Shield Trauma Kit is barely taller than my pen. This is the SHTK-2 version. The Shield is the smallest and most compact of the Sons Trauma Kits. This kit could be placed in a cargo pocket, or easily in a rapid response bag, or duty bag. The kit could also be slipped inside a uniform shirt that has the hidden zipper behind the faux buttons. Phokus uses medical-grade vinyl for the bags that seal the items. The bags are machine pressure sealed instead of vacuum sealing. By using pressure to seal the bags, the bags maintain flexibility. Vacuum sealed bags are most often stiff and rigid, making them more difficult and less comfortable to carry in a pocket. You now cops, if it isn’t’ comfortable it’s going to get left behind. RF Welding produces a continuous waterproof seal designed to last 24-30 months. The vinyl bags are designed with a Quick Deploy Ripcord. By pulling on the tab that extends outward from the top of the bag, the officer can open the kit by use of a full-length ripcord. Once opened the bag can be pulled apart into two separate pieces that can act as an occlusive bandage. Options – the LVFR-2 can be tailored to your needs; NPA w/550, Combat Gauze, 14G Needle, Casualty Card (for triage), (2) 2″ Safety Pins, 3″ Elastic Bandage, Sharpie Marker. The Sons Low Visibility Trauma Kit is just slightly larger than the Shield, but adds the SWAT-T tourniquet which is a much better option. This is the LVFR-1 option. The rear view of the Low Visibility Trauma Kit. Notice the SWAT-T tourniquet and see-through vinyl. 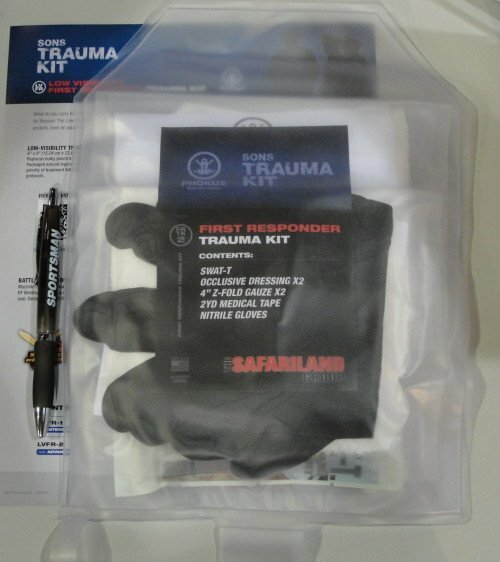 The Sons First Responder Trauma Kit is a mix between the first two. MSRP – Not available yet. The Sons First Responder Trauma Kit is the largest kit I review, but does not offer too many advantages over the other two more compact trauma kits. This is the FRTK-1. A side-by-side comparison of the (3) Son Trauma Kits reviewed here. 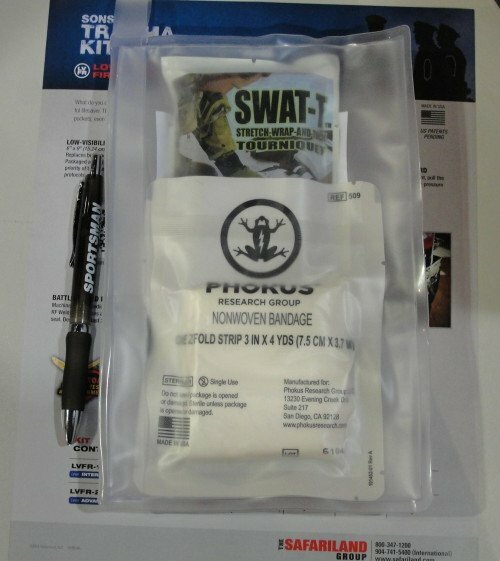 There are two larger Sons Trauma Kits by Phokus, called the Deployment Trauma Kit II (DVK II), and the Advanced Mobility Trauma Kit (AVTK), but those kits contain even more supplies that typically exceed the needs of individual officer trauma kits. They are also $143 and $180 respectively, making individual officer issuance harder to justify. 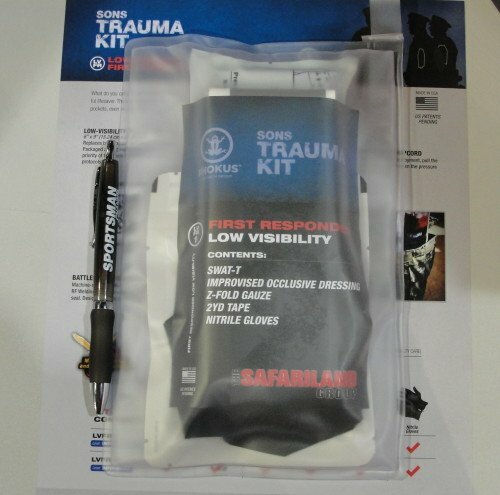 Personally, out of all the Sons Trauma Kit options I prefer the Low Visibility (LVFR-1) model. The LVFR-2 adds medical supplies and techniques that should only be performed by licensed EMT’s or Paramedics. Whatever you choose, get a solid tourniquet. The SOF-T, CAT-T, and SWAT-T are the most popular selections in law enforcement. If you can, try to outfit a trauma kit with gauze, pressure bandages, and tape. You should already be carrying nitrile gloves so save the space, and in a pinch, the knife (or seatbelt cutter) you always carry can be used as shears – carefully. Excellent comments on the trauma kits. How much would 7 of the shield trauma kits cost? Scott, we do not sell these kits but Mod Armory has them for as low as $35.00 each.